Welcome back to Term 4 here in New Zealand – only 8 weeks to go before the Christmas break – so much to fit in and such little time to do it. I am still fizzing from all of the wonderful things I learnt at ULearn in Rotorua. I have successfully used Show Me with a lower ability student to record a mini lesson. He could then take away the iPad and replay the lesson while working independently. He was also very keen to share it with others in the class too. Viewing the lesson again and again wasn’t a problem! Your children’s videos would be a fantastic way of sharing how to do “new maths” with parents on the class blog/wiki. 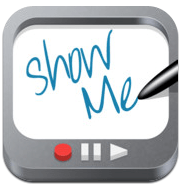 We are loving Show Me as well – I’ve been using it for portfolio snapshots to show mastery of goals… Kids love using this app to show they can do something new and asking me for their next target! We store these in folders that the children can access to share with families and use for reflection.